“Even When She Was Drinking, Nothing Changed"
What if college sports administrators and coaches were subject to the same amateur restrictions as players? Are you interested in basic economic rights, negotiating the terms of your compensation for services rendered and organizing with other people who feel the same way? Are you a fan of laughter, long walks on the beach and the Sherman Act? Great. 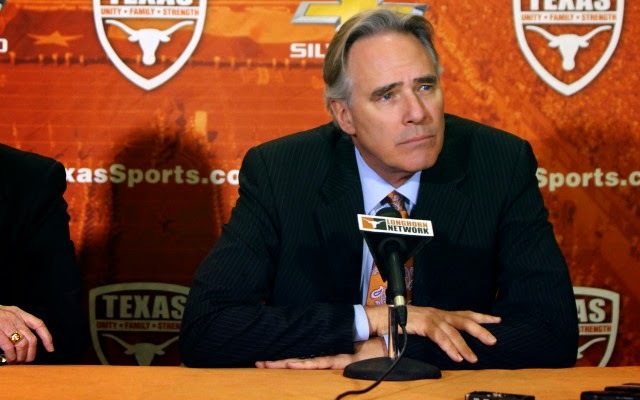 University of Texas athletic director Steve Patterson has some advice for you: stay the heck out of college sports. Because college sports are different. Completely different. That’s his reasoning. Yesterday, Patterson told reporters that he doesn’t agree with a recent regional National Labor Relations Board ruling that Northwestern University football players are actually school employees. … Professional athletics is something completely different … if you’re a football player coming out of high school that decides you want to go to the pros, go take your issue with Roger Goodell and the owners and the union. That’s your place to go if you want to go play professional football, if you want to be an employee. If you want to go play professional basketball, go to the D-League, knock yourself out. And then go in the draft to the NBA. That’s your place if you want to be an employee, if you want to be a professional. For years, I’ve been arguing that college athletes ought to enjoy the same basic economic rights and protections as the rest of us. But according to Patterson’s airtight logic, that’s wrong. Backwards, in fact. The real problem with campus sports isn’t amateurism. It’s professionalism. It’s people not knowing their place, refusing to make clear choices all day long in our gloriously free country, declining to knock themselves out by going to the NFL, the NBA, the D-League. Yep, the problem is people like Patterson. Patterson reportedly is paid a $1.4 million annual salary. Plus bonuses. He seems to believe he’s an employee. A professional. Same as all the other administrators and coaches in college sports. Only Texas isn’t the Dallas Cowboys. It’s college sports. Student-athlete athletics. Completely different. And that difference should be acknowledged. Respected. Celebrated. Vive le difference! You really want to fix college sports? End the endless debate over financial inequity and fundamental fairness? Free up some cash to fund more women’s rowing? Here’s a modest proposal: Subject Patterson and his peers to the same rules they currently foist upon athletes. Amateurism for all. Because, really, this ain’t the pros. STEVE PATTERSON enters and sits across from BILL POWERS’ desk. PATTERSON: I’m here to interview for the athletic director job. POWERS: I think you mean student-athlete athletic director. PATTERSON: I did. I’ll be working, right? PATTERSON: Well, being an athletic director requires putting in 50-60 hours. Maybe more. About the same amount of time Northwestern football players spend on their sport during preseason training camp. It also means overseeing a large budget and dozens of teams, making coach hiring and firing decisions, negotiating rights and sponsorship deals, glad-handing with alumni and boosters, complying with NCAA rules and lots of other tasks both at and away from my desk. Vanderbilt’s David Williams says that to be an athletic director, you should “go spend a year in law school, a year in business school and a year over in the college of education, and then take some communications stuff. And then get yourself a big old box of aspirin.” That sure sounds like work to me. The kinds of things actual employees do. POWERS: Nope. Working is for professional athletic directors. As a student-athlete athletic director, you’re an amateur. POWERS: An amateur is someone who is not an employee, and therefore not entitled to things like workers’ compensation. PATTERSON: I guess I could use my salary to pay my medical bills if I ever get hurt on the job. POWERS: Don’t worry about that. [Laughs]. There’s no job for you to get hurt on! PATTERSON: But there’s a salary, right? POWERS: Of course not! Salaries are for employees. College sports are different. Completely different! [More laughter]. Patterson, let me ask you something: Do you know how much this student-athlete athletic department made in 2012? PATTERSON: I do. About $163 million. Very impressive. One of the main reasons I wanted to work — excuse me — be a student-athlete athletic director here. POWERS: And do you know where that money goes? To people who work for it. Like me. And other education professionals. It’s like my daddy always said: a man’s got a right to make a living. Unless he’s involved in college sports. PATTERSON: So what do I receive if I sign on here? POWERS: You get a hell of a deal, is what you get! Ask Jay Paterno. Room and board, all paid for. A free year of tuition for every year you serve. The opportunity to train to become a more valuable professional job candidate someday. Access to administrative assistants, university computers and faculty lounges — all free to you, the student-athlete athletic director. Any medical costs incurred beyond your personal insurance are covered. If you have a death or emergency in the family, we may fly you home. And back, even. You’re also free to receive federal grants up to $5,550 a year — I didn’t ask, do you have kids? — and are allowed to tap into our needy student-athlete athletic director fund for several hundred dollars a year to buy suits. Plus, football box seats, 50-yard line, gratis. And all the locker room access you want. You know, the opportunity to have a roof over your head, eat prepared meals, work out at our swanky new gym and watch one of the most popular college football teams in the country for free looks pretty good when you consider the average American has to work all day just to pay for all of those things, doesn’t it? PATTERSON: I’d still like a salary. I think I’ll go apply at Texas A&M. POWERS: OK, but they offer the same deal. PATTERSON: Baylor? Rice? SMU? Houston? POWERS: Yep. Every college in the country offers the same deal. We’ve agreed on that. Room, board, perks. No salary. POWERS: It is for amateurs. PATTERSON: But what about antitrust laws? POWERS: What about them? This is college. Things are different here. PATTERSON: It almost sounds like I’d have to unionize to get a better deal. PATTERSON: Can’t you make an exception for me? Pay me something? I mean, I’m pretty good at what I do. A lot of schools would love to have me. POWERS: We could, but then all of the other schools would boycott us. PATTERSON: [Low whistle.] That’s a hell of a catch. POWERS: The best there is. Look, if you want more than what I’m offering, I suggest you apply for a team president job with the NFL or the NBA. PATTERSON: But … there are only about 32 jobs in each of those leagues, and 347 Division-I student-athlete athletic director positions. POWERS: In that case, you should go to Europe. Or Mexico. Japan? Perhaps there’s a youth sports academy job for you there. Anyway, nobody is holding a gun to your head and saying you need to be a student-athlete athletic director. It’s a free country with lots of choices! You could choose to go sell life insurance. Or work at Arby’s. We have one on campus. I hear they’re hiring. POWERS: Unfair? Trust me, you can live on a food and housing allowance — if you do the math, it’s better than what we pay the people who wash dishes at the Faculty Club, and you don’t hear them complaining. PATTERSON: But I have great ideas for building the Texas brand and making even more money. Like playing games in Dubai! POWERS: Dubai? That is a good idea. There’s a lot you could learn from that country about labor-management relations. PATTERSON furrows his brow. POWERS places a national letter of intent and a flat-brimmed Texas hat on his desk. POWERS: So, are you in? PATTERSON: I need a day to think about it. POWERS: Great! Before you make up your mind, you should check out our weight room. It’s not as nice as Alabama’s, but it’s pretty darn impressive. PATTERSON: And I get to work out for free? POWERS: Of course! Just like you get a free continuing education with those tuition vouchers! PATTERSON: Hmmm. I dunno. It still seems like something isn’t right here. POWERS: Patterson, I’m looking at your resume. Says here you previously were employed by the Houston Texans, the Rockets and the Portland Trailblazers. Three completely different professional teams. POWERS: Then shouldn’t you already know how this works?